Since I have been doing the site, ‘Bid Board Finds’ has been one of my favorite segments to tackle. I have got a bunch of cool stuff: https://angrycardcollector.com/category/bid-board-finds/ You never know what you are going to find week in and week out on the bid board of your card shop. This haul is no exception. I scored 3 items for $7.75. None of the items are low class, and in fact all 3 would probably be the best item of most of the ‘Bid Board Finds’ that I post about. I will be honest, I may have overbid on the first item because I wanted it so bad. It is not even a card and probably worth nothing but I don’t care because of how unique- at least for me as I will never think to check Ebay an item like this, or anywhere else. An ‘authentic meteorite.’ It is tiny, just bigger than the ballpoint of a pen. The other 2 items are patches/prime jerseys from former Dodgers. My personal favorite is the Kevin Brown swatch as it came from a time when patch pieces were not a dime a dozen, plus it’s from Fleer. I also wasn’t collecting in 2002 as I was busy in high school, and running a successful music website that saw me go to a few concerts a week. Very small bid board find for this week. I bid on a ton of stuff but only came away with one item, a dollar flyer I took on former Dodgers first round draft pick Chris Anderson. Judging by his stats this year, he looks like more of a suspect than a prospect. I can’t complain, it was a dollar Dodgers autograph going to a Dodgers fan in a Dodgers town. My second foray into PackRip.com sees me going beyond the trial packs and actually testing out a product. I didn’t count how many offerings the site had, but I would be willing to be that it was probably close to a dozen or two dozen. My goals for this crusade was to open a pack that delivered on quality and had a video. I was looking for several things in the video: how long it was, if you saw the cards well, and if the pack opener talked at all. My main critique about breakers is that they linger when they open packs. Dude, just open the pack; we aren’t paying you by the hour. I chose two packs of Panini Crusade Basketball from 2012-13 for $19.50. I am very familiar with this product, as my favorite hobby shop always has it in stock. I was excited because I have been told of the hits that I have come out of the product. Like Certified, it has a hit per pack. The video came up instantly after my purchase. It looks small in the screenshot, but it is clearly designed to be maximized for full screen use. The video was short and sweet, last a little over a minute. This is a not insignificant point to me and a major plus in my book. Still a little longer than I would take to open a pack but not much. My hits sucked but that is not the fault of PackRip.com. The redemption was hard to read on the video but the person opening the pack was very clear in who it was. Another selling point is that you don’t have to watch the video if you don’t want to. You can just click the ‘Click to reveal your hits’ button. Expect another post or two about PackRip.com. I am leaning towards doing a giveaway when I finish off my spending spree on the site, so sign up with them we can do some trading. I have to be honest, I had no interest in participating in this promotion. Yet today when I left to make a quick trip the store, I somehow found myself on the freeway headed to my favorite card shop. If you read the site, you know this is my first time doing this. I rationalized it by saying that I haven’t shown my face to my favorite people, and card shop owners, in a while. Honestly, it was worth it just to see them. I spent more than required amount so I got the Kris Bryant card, which was in a one touch. I am debating opening the pack – I won’t resell it anything, I am just like that. I also got a few other things. Below is the highlights. Cool story about the Benjamin card. I was on my way out but then called back in and offered it for a low price. Honestly I was so happy that he thought of me, that I pulled out the cash sight unseen. The autograph from Certified is Mark Aguirre. Also buried underneath all of that is third party graded Jeff Bagwell rookie that I scored a buck. PackRip.com is the latest innovative card seller that has come up on my radar recently. They have piqued my curiosity because they check a lot of boxes regarding collectors needs. If you are unfamiliar with their product, they are on demand card packs. It can be hard for some people to satisfy their appetite when they are hungry for cards. Lets face it, some people just aren’t close to a Target or more specifically a card shop; and if a hobby shop is not in their area, good luck finding hobby packs. They are forced to buy cards online or go the breaking rout. Breaking is fine but it lacks the guarantees and is a shot in the dark. Me personally, I would take a company like PackRip over breaking most of the time. I have been dying to try the site but as this blog documents, funds on my end are severely limited. Fortunately I came into PackRip funds, so I was lucky enough to give it a try. One of my favorite weekly reads is a blog that the people from Blowout Cards do called ‘Blowout Buzz.‘ Like a lot of blogs, they review products from around the hobby and specifically what Blowout Cards sell. With access to the Blowout inventory, they are able to put together some great content on the site. Their site is worth a visit; as well as their Twitter being worth a follow. They occasionally give away some hits from their reviews. I won this Kenny Lawler autograph from their 2016 Panini Certified Football break. The Floor Piece was from the all star game that took place at the Staples Center, so my go to venue being that I live in the LA suburbs. The Kevin Durant rookie card was not in my product. I don’t know if that was an oversight or if it was because I hit a jersey that came one in four boxes, but I am bummed. In my mind the Durant rookie was one of the bigger selling points for me – over the memorabilia card and packs. It was nice to see Prizm packs inserted, where my best hit was a Sam Jones parallel. The Rick Fox hit was decent to me. He is still relevant as he does a ton of acting now, so I occasionally see him on television. Even without the Durant rookie card, it was worth the $12.99. I would take this over an underwhelming blaster box any day. I will review my other box soon. I have it sitting on my desk for when I have an appetite to open packs. 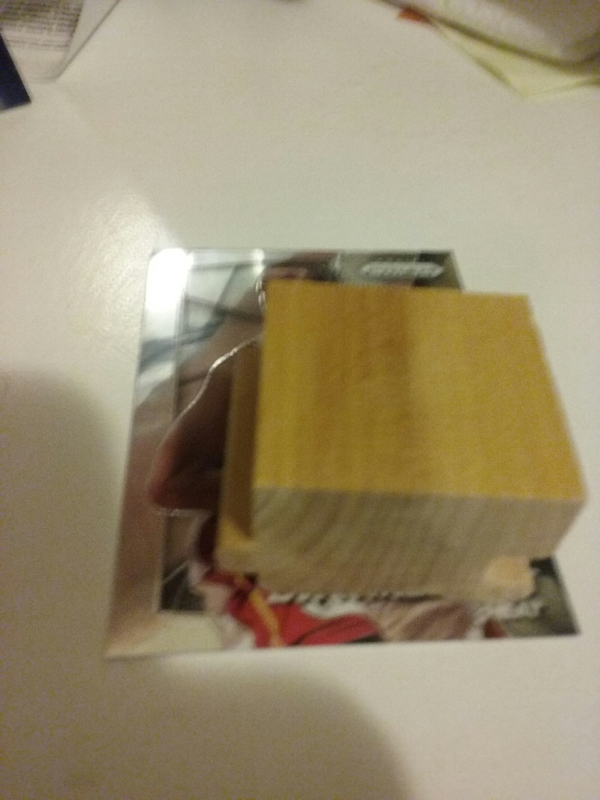 Update: Someone on Twitter who pulled a mini jersey in this product, got his Durant rookie card so it looks like my box in an anomaly. Per a request, here is a picture of the floor piece with a card used for size reference.